Dyronil | JBL Drug Laboratories. 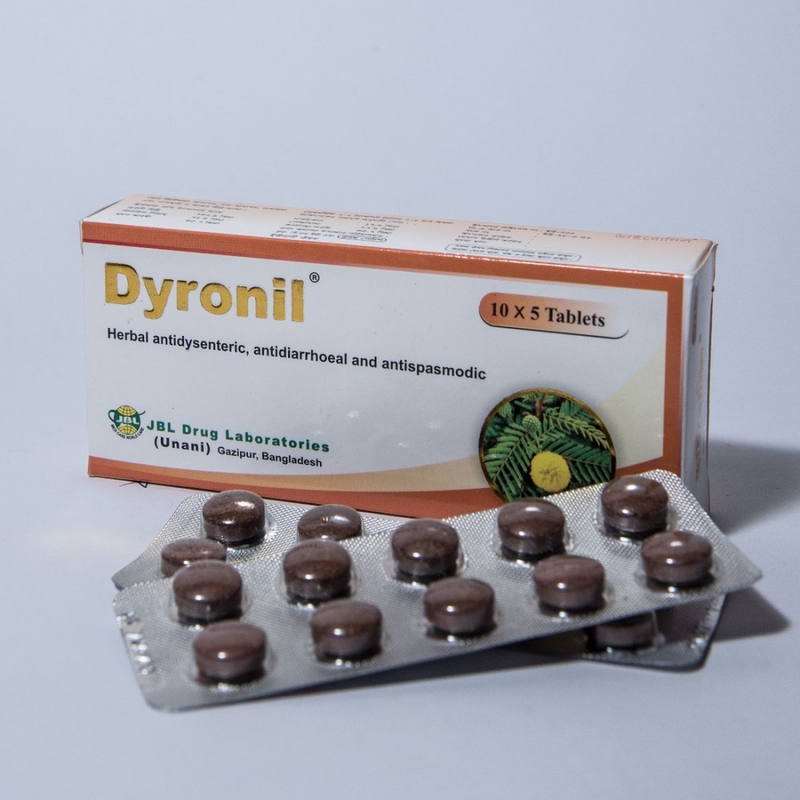 Dyronil is a herbal anti dysenteric tablet . 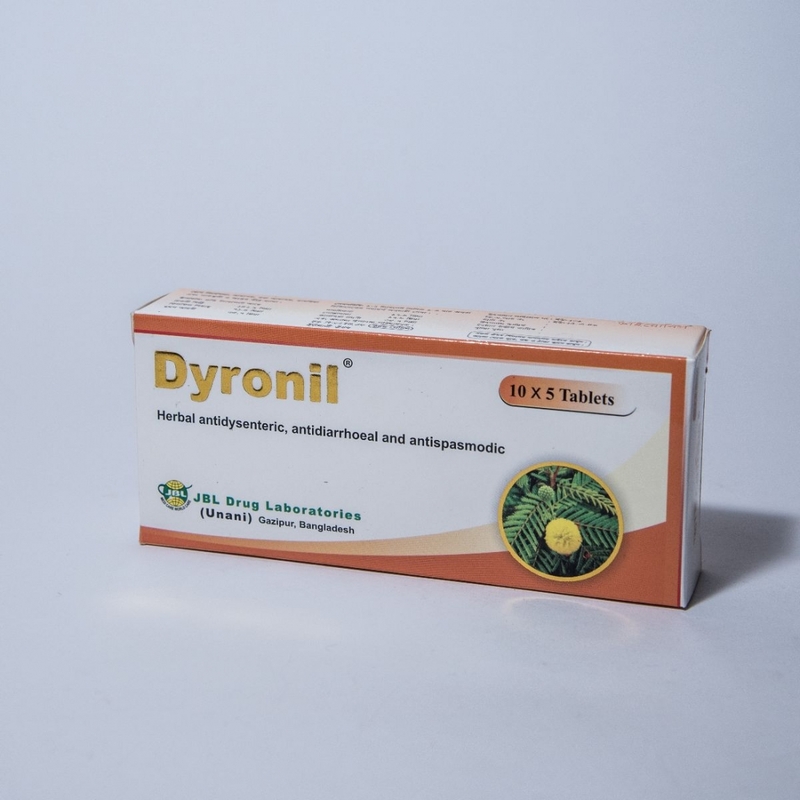 Describe the pharmacological properties of the herbs used in Dyronil tablet. Quercus infectoria : It contains tannins , which have ability to combat various virus, while at the same times strengthening the tissues. It is useful in chronic diarrhoea, dysentery, bleeding haemorrhoids, varicose veins and long standing gonorrhea. Terminalia chebula : It has mild laxative, thermogenic, adaptogen, anodyne, acrid, purgative, digestive, carminative, anthelminitic, astringent, antiseptic, stomachic, tonic and alterative properties. It is aneffective purgative and helps in removing toxins. Emblica officinalis : Amla fruits is a natural and efficacious antioxidant which contains the highest amount of vitamin C in natural form. It is acrid, cooling, refrigerant, diuretic, laxative. The dried fruit is useful in anxiety, melancholia, haemorrhage, diabetes, diarrhoea and dysentery. Cinnamomum camphora : The gum resin is antiseptic, analgesic, antispasmodic, antirheumatic. Crocus sativa : It contains natural Riboflavin and Thiamine. Saffron is used a nervine sedative and useful in fevers, melancholia and enlargement of the liver. Rosa damascene : It is useful in diseases of the brain, stomach and liver. 1 tablet 2-3 times daily or as directed by the physician . Each box contains 5x10=50 tablets in blister pack . No known side effect with Dyronil tablet are noted .